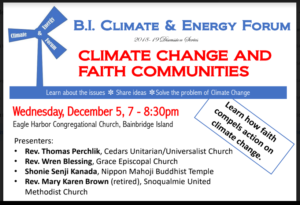 On Wed., Dec. 5 at 7pm at Eagle Harbor Congregational Church, the Climate & Energy Forum will host a discussion about the role of faith communities in addressing climate change. 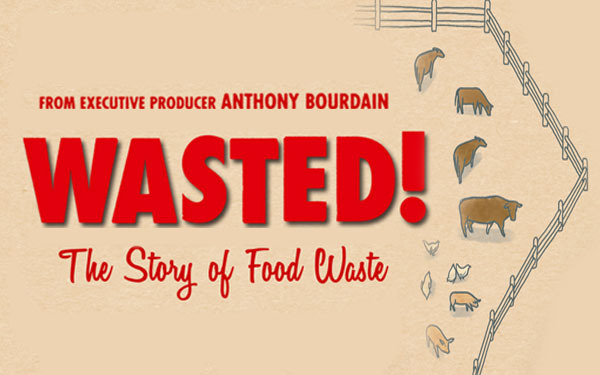 And on Thursday, December 6th at 7pm at the Library, watch Wasted, a movie about the impact of food waste. In this podcast BCB host Christina Hulet and returning guest Michael Cox share information about these two upcoming events. Presenters at the Forum will include: Reverend Thomas Perchlik of Cedars Unitarian /Universalist Church, Rev. Wren Blessing of Grace Episcopal Church, Shonie Senji Kanada of the Nippon Mahoji Buddhist Temple, and retired Reverend Mary Karen Brown of Snoqualmie United Methodist Church. Together, they will talk about how religious faiths are working to preserve the natural environment. For more information about the Climate and Energy Forum visit: www.bainbridgeislandforum.org. Wasted is being shown at the Library on December 6th as part of the Movies That Matter film series, a new free monthly film series on the first Thursday of every month. It describes how much food we waste and the significant impact this has on our environment. In addition, Michael and Christina reflect on our recent election results, in which voters rejected the statewide carbon fee, Initiative 1631, and the local SAFE mobility levy. What we can learn and how can we continue to help climate change work move forward?